There is a point in every hotel stay where, I believe, you decide if you love it. Sometimes this happens directly on arrival when you fall for the wall tiling or hanging drapes. Other times, it’s later on when you’re packing your bags and find an overwhelming nostalgia for the place already welling up inside. 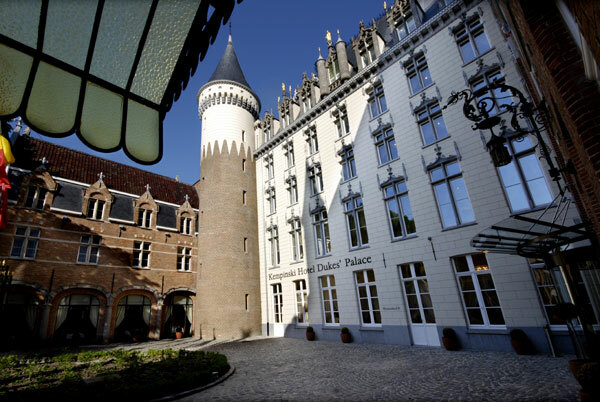 For me, love happened at around 11pm while I was stood in the bathroom of my suite at the five-star Kempinski Hotel Dukes’ Palace in Bruges. It was freezing in the petite Belgian town; so cold, I’d started to think I might never naturally be warm again. I had left my friends to return to the splendour of the Dukes’ Palace and found myself sleepily padding barefoot into the shiny black and white tiled behemoth of a bathroom. But something wasn’t right – suddenly, my chilled toes were returning to a lukewarm state. I looked down and a passive smile overwhelmed my face. The floor was heated. This was but one of the tiny, magnificent details that come as standard at this 15th century palace. On arrival in the gold and red regal room, I found a sketched card showing the building’s facade with a welcome message from the manager. On top was a baby box of chocolates from B by B, so luxuriously creamy that I never surpassed them during all my chocolate shop sampling in Bruges. The thing about the Kempinski is that it’s marvellously divine but it doesn’t splash its perfection to the outside world. It warms you with its understated pedigree and – as a forewarning – you may never want to leave from inside its cushy walls. 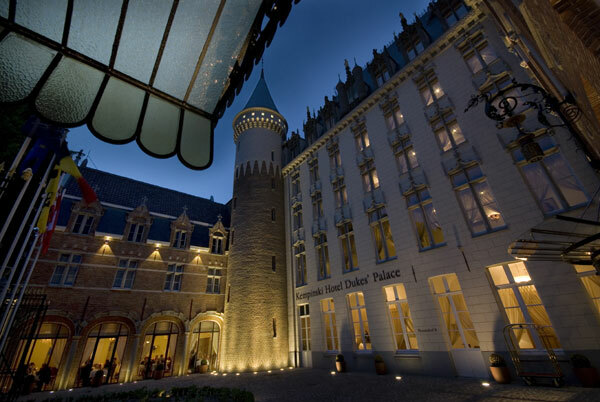 Hidden down a side street off of Noordzandstraat near the town centre, the Kempinski Hotel Dukes’ Palace is just what it says on the tin: a former palace. Philip the Good (a Duke of Burgundy famous for his help in the capture of Joan of Arc) started construction in 1429 for his wife Isabella of Portugal, to celebrate their marriage. It was around seven times bigger than its current form and, at one point, even included a zoo and botanical gardens. The palace stayed a home of the Dukes of Burgundy before eventually being sold and turned into a nunnery in the 17th century. What exactly happened to the resident nuns is of contention, but when the hotel was undergoing its six-year renovation, the builders found hundreds of silver coins from the 18th century. It is believed the nuns had to flee at some point and so buried their treasure in safety, never managing to return and claim it. Many of the artefacts found – including some coins and perfectly preserved pottery – can be seen on display in the hotel, while part of the collection was donated to local museums. During the renovation, months of research were taken by an interior designer with a penchant for historical exactitude to unearth exactly how it looked when it was first built. These elements, such as the eggshell blue paint in one of the meeting rooms, matching precisely what was there hundreds of years before, work seamlessly with the more modern art style of the rest of the hotel. The original cascading staircase still stands – although, now featuring a secondary higher inner banister which shows the height differences between people in the 21st century and the 15th – while downstairs there is a chapel with original frescoes and stained glass that have survived since the start. 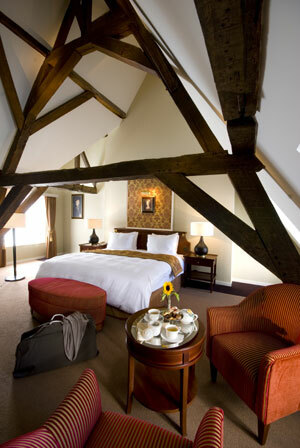 Original frescoes also appear in six of the upgraded suites and are deemed sites of historical significance in Bruges. Featuring beside Molton Brown bath products and espresso machines, it is a strange but alluring combination. So from palatial foundations to heated floors, the hotel has continued its elegance to this day. While there might not be a zoo, there is a sumptuous spa with tantalising pool area and hammams, an award winning restaurant and a quirky, streamlined bar area featuring a giant paintbrush sculpture whose tips change colour with the setting sun. 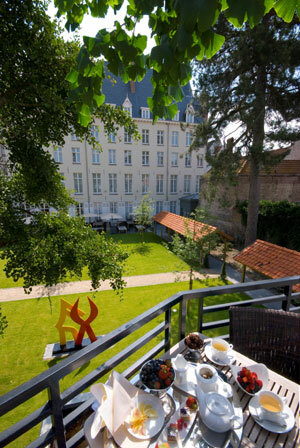 The rooms range from junior suites in the old part of the building, to the palatial suites with original artwork and marble bathrooms, and regular rooms (which are still loftily cushy). In my room, an oversized bed took up the lion’s share of the main part, while gold and red striped club chairs and wallpaper added a Tudor touch. It overlooked the perfectly trimmed grounds displaying quirky sculptures, which currently include a giant pink poodle. The bathroom, with its heated floors, gargantuan bathtub, rain shower and separate toilet, stepped away from history into modern sleek, with sparkly spotlights and lustrous tiling. To get to the rooms, one can opt to take the lift in the hotel’s newer section, or the grand spiral staircase in the older part. I recommend the latter as on each floor you can peer through towering stained glass windows across the rooftops of Bruges. A peak outside at sunset reveals the white facade turning pink, the gargoyles melting to a less-vicious hue. And one mustn’t forget breakfast. In true grandeur, I opted for room service and felt truly spoiled. At the pre-appointed time, a demure woman entered, wheeling in a circular walnut table, set with eggs, croissants, smoked salmon, cured meats, fruit, yoghurt, coffee and champagne. As I reclined in the luxury of my plump dressing gown, and wiggled my warm toes, I had to say: I felt rather like a Duchess in a perfect palace.